I was still feeling a little banged up from our tour to Hel basin, but when Mike suggested Colchuck, I knew it would be a great ski. 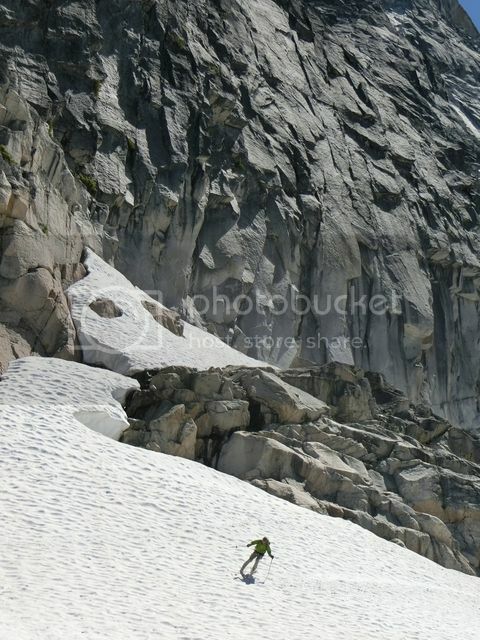 If you go to the Enchantments on the third of July, it would be foolish to expect anything but a carnival atmosphere, it lived up to all that! 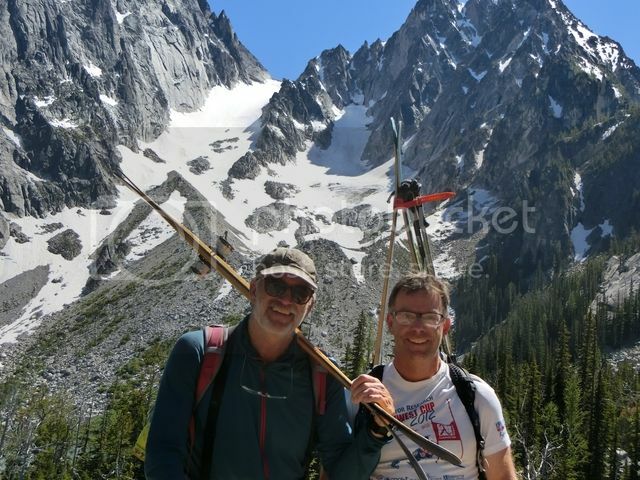 We decided to bolder hop only once.� We put our skis on at the top of the moraine, managed to skin most of the way, but did decide to do some booting, the top 800 feet or so was pretty firm at noon so we took short lap on the Porcupine side, waiting for the Colchuck side to soften up.� Started down about 2:30 and it was just right,� first time either Mike or I had conditions to ski the very steepest lines (Mike more than me)� total hero snow. 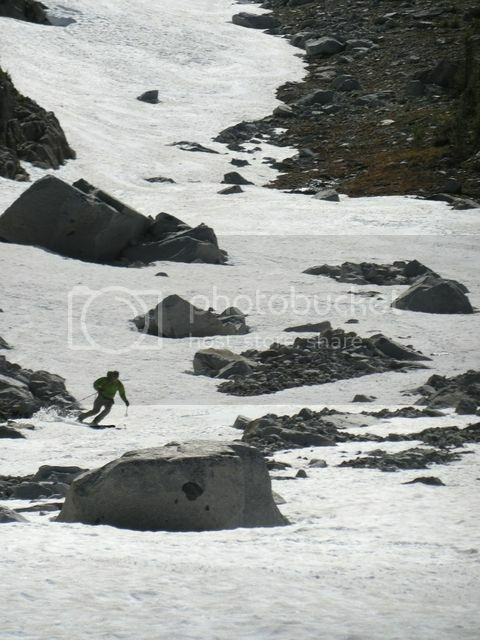 Skied within a rock throw of the lake, just wonderful. We did some tree removal on the way out, and picked up a half bread sack of litter. This one is near the lake. There was a perfect lane through the rocks. (I bet you'll be able to ski to the bottom for only another week). Jamie's signature, right down the middle. My tracks are off to the right in the shadows. 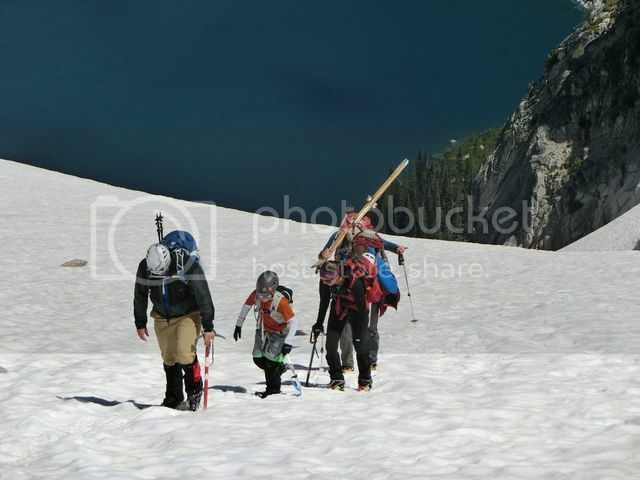 Here was a highlight - this family was climbing Colchuck with their 9 year old son.� NINE. 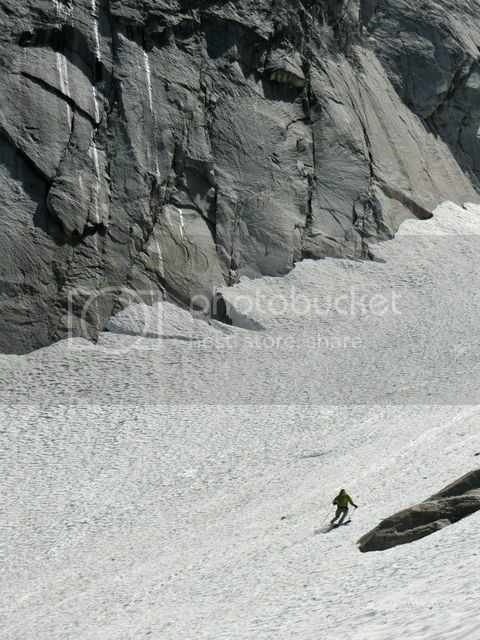 They kept pace with us all the way up the glacier and we could hear the kid chatting along the whole way. 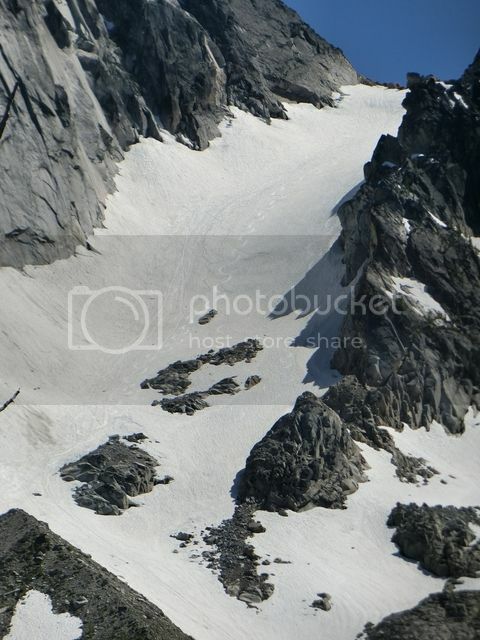 Dad told us they had skied off St Helens this year and had also been on top of Adams. He said they had plans to go to Baker later this summer. Wow. He's going into 4th grade. Badass kid! It was great running into you guys up there! I was the friend with the family you posted a picture of. They were all excited to see the little bit you wrote about their youngest, and shared your post on facebook. I felt compelled to share that the most impressive part about that family is not their kids mountaineering accomplishments (their older son, 11, broke his elbow and wasn't able to join but is very much cut from the same cloth). The kids' dad, David, is battling brain cancer - an Oligodendroglioma to be more specific. He had a tennis ball sized tumor removed in 2011, and just last month finished a round of proton radiation therapy. Just thought you guys might like to know that there is a more impressive story behind the cool little piece you got to share with us on Sunday! Thanks again for sharing the photo, and glad to see you had a great day! By the way, the 9 year old (Cade) was his usual strong upbeat self and summitted Colchuck before chatting away all the way back to the car (a 14+ hour day). Certainly an inspiring family. 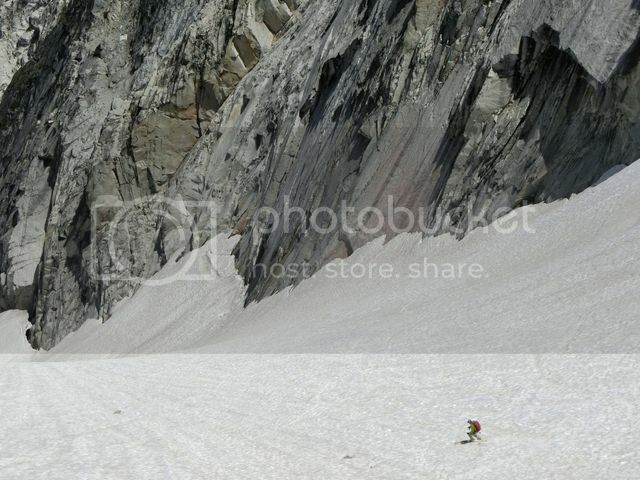 Competent parents taking their kids into the mountains... not something you see every day. I appreciate it every time I see it. Car to car is an impressive amount of endurance for someone so young. All my best to David. I hope he recovers fully. He is clearly contributing to the good of the world.